Doll Quilt 12" x 15"
Little Red doll quilt measures 12" x 15". 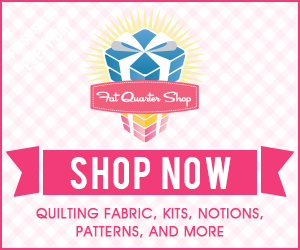 It is a great pattern that is very quick to make using the chain piecing method. 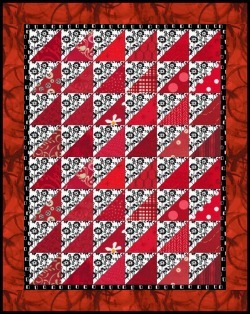 When ever I see red and black together in a quilt I find the result quite stunning, hence my choice of fabrics for this quilt. You can select a limited color palette as I have done using only 2 colors or you can have as much fun as you like with your colors. Below is the same quilt showing a different colorway. 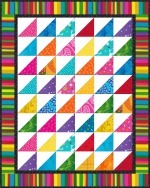 As this quilt center uses squares no bigger than 2 1/2" this is a great quilt to be made from your stash or scraps. The half square triangle design though simple is also very versatile. Using period fabrics eg 1930s, modern brights or country flag colors for example, creates a totally different quilt that looks authentic to most eras it's designed for. 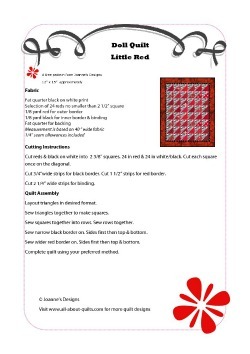 To make this Little Red quilt you will need a selection of red and black on white fabrics. 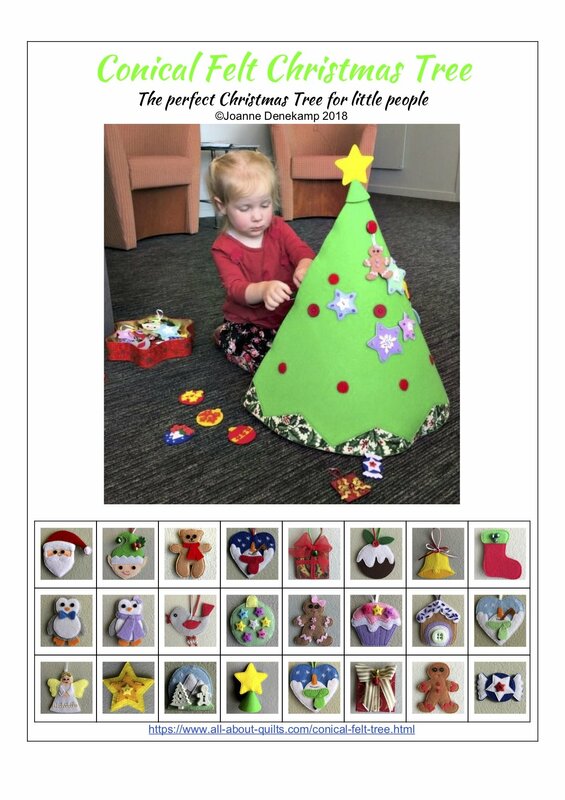 My pattern shows 24 different red fabrics being used. It is not necessary to use such a large variety to make a stunning quilt. Use what you have and you will be pleasantly surprised with your result. There are 2 ways to make this quilt with speed. I have written them both below. * Using Marti Michell's template set A number 6, place template on fabric strip following straight of grain markings & cut. 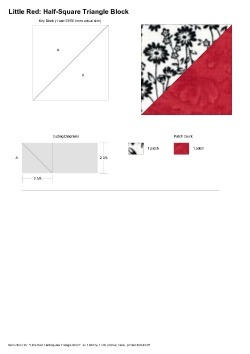 To download the PDF pattern click on the pattern image below. 2. When all your triangles have been cut lay them out on a flat surface or design wall. 3. Sew the triangles together into squares. 4. Sew the squares together into rows. 5. Sew the rows together. 6. To have the seams sit flat remember to press every alternate seam in opposite directions. This will reduce the seam allowance bulk and help to have the seams to line up well against one another. 7. Before adding your borders remember to measure your quilt so that your quilt will sit flat once finished. As they say it is best to measure twice and sew once! Quilt and bind using your preferred method.